The New York Times had one of their regular Sunday articles slamming Israel for some reason or another. This one was because Israel is accused of not doing enough to help the tens of thousands of African refugees who have been flooding into the country. For context: Israel now hosts about one tenth of one percent of all worldwide refugees and displaced persons.. And those are the ones that the NYT feels compelled to write a photo essay on. It is true, Israel accepts far fewer refugees as citizens than Germany or France. But Israel is a tiny country and if it would accept a significant number of immigrants it would not be able to handle the numbers that would follow. If Denmark and Tunisia would magically switch places, Denmark would be building a fence and putting the refugees in camps as well rather than let the country be overrun with people who would outnumber the Danes if given the chance. Yet as the Times tries to paint Israel as vaguely racist for not allowing these Africans to stay in the country, it engages in its own racism. Look at this sentence again: “one of the lowest asylum acceptance rates in the Western world.” Why should Israel be compared only to the Western world? Why is it not considered a possibility for the refugees from Darfur and Ethiopia to become refugees in non-Western countries? 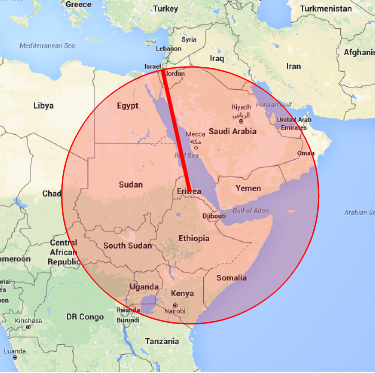 I count about 18 countries that are within the radius of distance from Eritrea to Israel. Why is it so absurd to ask that Saudi Arabia or Oman or the UAE take in some of their fellow Muslim refugees from the Sudan, or for Egypt or Jordan to accept Christians from Eritrea? Other African countries are poor, to be sure, but why is it so absurd to expect some of them to take in more of these refugees who share far more in common with them than most Israelis? To the New York Times, non-Western nations cannot be expected to act with kindness and mercy and charity. That is something expected from Israel, not from Egypt or Libya. .
No one is happy with how Israel is forced to act to discourage more refugees. But given that Israel is the only Western nation in the area, it cannot be a magnet for millions of people. The reason the trip to Israel is dangerous is because of the countries in between. Yet how much space has the Times spent on those who were murdered and raped and kidnapped en route and the culpability of the nations in which these occurred? No, those nations aren’t “Western” and therefore are not expected to engage in normal moral codes. No reason for the newspaper of record to bother writing about that – they are savages and expected to act that way. Of every country within the shaded area in this map, only Israel is expected to treat these people with respect. There is a story there. But it is not one that the New York Times seems interested in covering.